The iPhone's touch screen has a much faster response time than its Android and Windows counterparts, according to a new set of TouchMark benchmarks from cloud streaming company Agawi. Using a 240fps high frame rate camera along with a custom-built device called a Touchscope, Agawi measured the App Response Time (ART) of several different smartphones. The ART is the latency experienced between the time a user touches the device display to the device’s on-screen response. 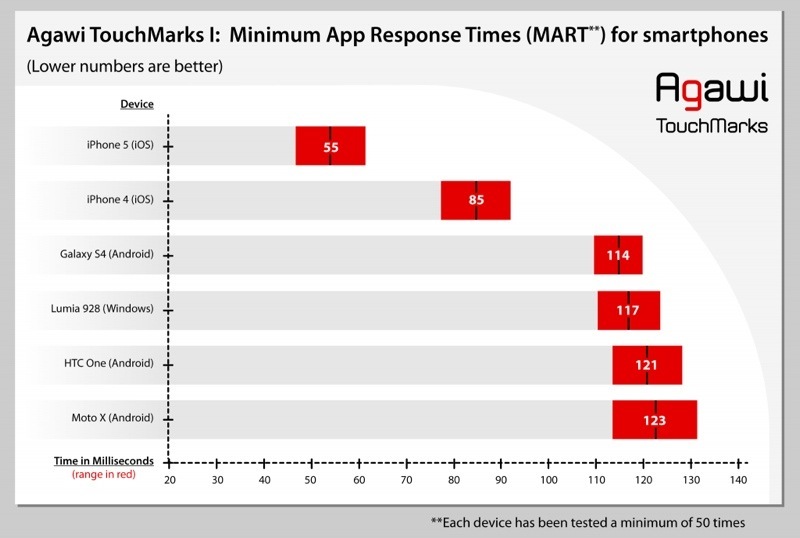 Apple’s iPhone demonstrated a minimum app response time (MART) of 55 milliseconds, a much better performance than the Galaxy S4, which had a MART of 114ms. The Lumia 928 had a similar high MART time of 117ms, and the iPhone 5's closest competitor was the iPhone 4, with a MART of 85. The HTC One and the Moto X had the highest MART times, coming in at 121 and 123ms, respectively. Relan, Agawi CEO, spoke to Venturebeat about the company's benchmarks. "App responsiveness is judged by how quickly the app can respond to your inputs," said Rohan Relan, cofounder and CEO of Agawi. "Smartphones with touchscreens that have lower MART scores feel snappier. This is probably why, to many users, the iPhone keyboard feels more responsive than an Android phone keyboard." Microsoft has published a video that demonstrates how the differences between various touch screen response times translate into real world device experiences. As seen in the video, there is a noticeable difference between a 100ms latency time and a 50ms latency time. Agawi speculates that Apple's touch screen hardware is better calibrated for capturing and processing touch than the Android and Windows devices that it was compared to. The company does note, however, that more comprehensive testing is required, and that coding differences may have slightly altered the results. In the future, Agawi plans to develop additional TouchMark tests, releasing both the hardware and software behind the benchmarks so that its results can be replicated. The company also plans to test additional Apple devices, including the newly released iPhone 5s and iPhone 5c. Who cares about screen speed? I've got a hex-core 6.5GHz ARM Z4-X345 with 64 petabytes of RAM, AND an SD card and removable battery. im not surprised. might be bias, but everytime i use an android phone, it feels clunky and slow. I have the new Nexus 7 tablet, it definitely does not feel nearly as responsive as my iPhone. I don't care what android apologists say, android is definitely clunkier and not as polished and responsive as iOS. I'm glad someone actually did a test on this. I sometimes feel like most people just don't care about or even notice lag. For me, it simply drives me crazy. If a mouse pointer, brush, or UI element lags, it really pisses me off and it makes everything feel annoying and slow. Your brain tries to evaluate your movements in real-time, and adjust your hand accordingly. If there's lag, you cannot adjust your movement as accurately. Apple does a great job at reducing such lag and it makes their products feel far more responsive, even if the actual processing time for tasks is the same. Take for example scrolling on a Mac trackpad vs. scrolling on a Windows trackpad. The former feels like you're actually moving the content with your fingers, while the latter feels like you're constantly being punched in the face by Mike Tyson. These things mean nothing to someone who simply isn't sensitive to it, which is why lots of people don't mind having laggy devices, and they will tell you that they don't notice any lag, while you can clearly tell the difference. I guess it is OK to talk specs as long as Apple beats Android. As soon as you bring up specs that are better in an Android device, all of the sudden you are a "specwhore". This isn't a discussion about spec though, it's the result of a benchmark, it shows real world results. The take home point should be that spec in itself isn't interesting, it's the resulting performance. No. The point was always that the kind of specs that are touted on Android (Mhz, # of cores) don't mean much if it doesn't result in better real world performance and responsiveness, which is exactly what these tests show. Um, this is about real-world performance, not specs. This is probably why, when I play with android devices at the store the home screen never feels as smooth as my iPhone.